What if we create a issue/PR in the gnome-software repository to change Gtk.ButtonBox to Gtk.StackSwitcher? What if we create a issue/PR in the gnome-software repository1 to change Gtk.ButtonBox to Gtk.StackSwitcher? To save the style with an orange stripe. Sure the fact that buttonbox can have a hierarchy very hard to style is a fact, however, I like the simple and clean look it has now. Tbh we discussed this a lot and we were also big fans of the orange underline. But this doesn’t look professional. Similarly, I can make a switches look like checkboxes. What is the point of StackSwitcher? Why was it created if there is a ButtonBox? What exactly looks unprofessional and under which criteria? Thank you for asking this question! Firstly, when you hover cursor over a tab, it isn’t much different from a neighboring tab. Secondly, when you hover cursor over a tab, during animation for a moment, it becomes the same color as a neighboring tab. Thirdly, the border of StackSwitcher almost invisible. It is necessary to add a background. Or it is better to return as it was. It’s the same border as with most buttons in the header bar that have a border (text buttons) and the same hover and active colours. I think it would be strange to mix them, now that we finally found a way to give every button a unified look. Before the buttons inside stackswitchers were a lot different than other buttons. So if you have an idea for a look that unifies all buttons inside and outside of boxes or stackswitchers, post some mockups in here. But why StackSwitcher should look like a regular button? In the previous style, I didn’t see anything wrong. The difference is quite visible though, that’s enough I believe. I don’t see it as an issue, being a transition, I think it’s ok. Moreover it lasts a fraction of a second. The function of stackswitcher and buttonbox (in this particular case) is the same, so I expect that also the look and feel is the same. We iterated over this version too back then. However we found the current solution to be a bit less “grid-like”. Also, I wonder how a version with the border looks less “unprofessional”. In Unity 8, only one application icon was used. And now are 12 icons of different sizes. What if we refuse small icons? Firstly, less expensive for developers. Secondly, possibility of using vector icons. On the left is 256x256 icons. On the right is 48x48 icons. 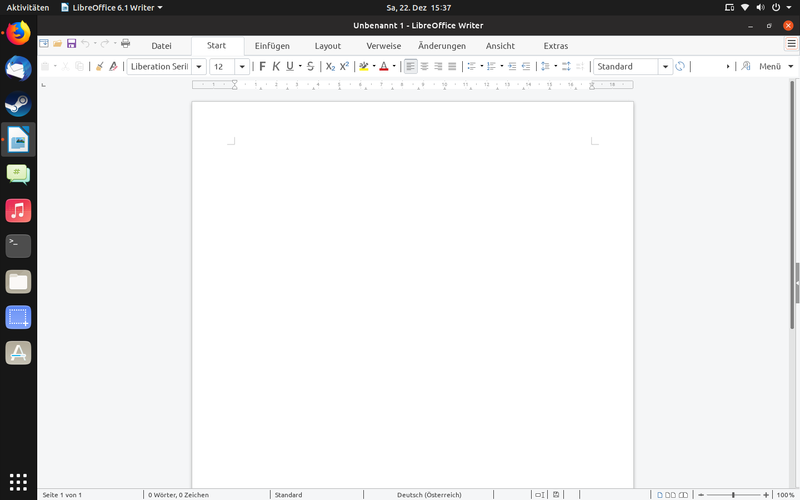 If Ubuntu 19.04 gets LibreOffice 6.2 this will have moved out of its experimental status. The icon set is Colibre, which is a bit less “gnomey” but looks more professional and cleaner to me at the moment. I will have to re-evaluate when the elementary icon set gets its big update in LibreOffice 6.2.